Maria Montessori developed a revolutionary, hands-on approach to education with an emphasis on respect for the child, believing that children who are respected will be children who will change our world for the better. The respect she espoused was that of understanding and respecting each child’s developmental timetable, and in a caring, safe environment providing works which are thoughtfully prepared with this development in mind. The prepared environment that the child learns in consists of the furnishings, works, and the teacher herself, and each must be prepared to best support the important work of the child. The prepared environment includes materials that are to be touched, manipulated and explored. Lessons with the materials include concrete demonstrations of materials before moving on to abstract concepts. Many lessons are multi-sensory so that the child may hear, see, and touch the information presented to them, thus addressing as many learning styles as possible simultaneously. 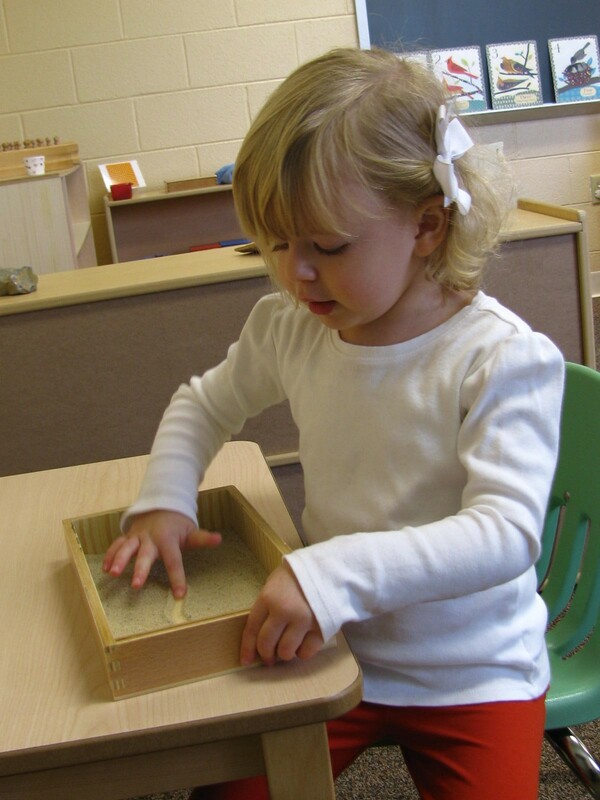 Montessori classrooms operate under the assumptions that children go through “Sensitive Periods,” which are times in their development where they are particularly disposed to learning certain skills, and that each child is gifted with an “absorbent mind” that is capable of acquiring endless amounts of information which will be used to build the child’s understanding of self and the world around him. The teacher’s role as observer and facilitator is to note these specific forces in action that drive each child, and so direct the child to lessons and activities that support what is developing inwardly in the child. Overarching goals in a Montessori classroom are those of achieving coordination, concentration, independence and a sense of order. Self-correcting materials that a child chooses on their own allow the child to work and problem solve without a teacher’s aid, supporting the child’s independence and confidence. A child’s ability to concentrate is highly valued so that they might absorb the information that a material is designed to convey, and so that the child’s endeavors to attain mastery of a skill are not interrupted. Therefore, a child absorbed in a lesson or work is allowed to continue without interruption unless the teacher feels it imperative to do so. All children are taught to respect another’s work time, and to not interrupt as well. The materials themselves target fine and gross motor activity which develops the child’s coordination, and offer information that helps the child form an understanding of how things in their world work together, developing their growing sense of order. In a Montessori classroom, importance is placed on the process the child is taking part in and the skills they are developing as a result. Therefore, there is not the same amount of paperwork, or worksheets, brought home as in a traditionally set up classroom. For example, a child may choose the Tower of Cubes to work with, which consists of ten cubes in graduated size that the child uses to discriminate size, and to create different configurations with the cubes.